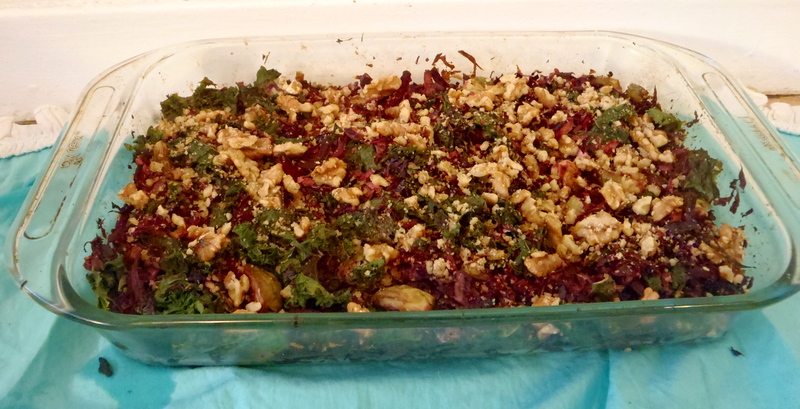 My roasted veggie storm supply featuring: beets, red cabbage, kale, Brussels sprouts, onions, and garlic topped with walnuts! Had this in class the other week and now I’m totally hooked. Hello friends! It’s just going to be a quick post today since I’ve got class soon, but I wanted to pop in to say hello. Now if any of you out there live on the Eastern seaboard, south/central Ontario, or Quebec, you’ve likely heard of this little storm called Hurricane Sandy. Or as some creative weatherpeople have dubbed it, “Frankenstorm.” As I mentioned yesterday, I love storms, perhaps because during the first one I can remember (the ice storm of ’98 I believe) we got to stay at a hotel and eat yummy buffet breakfasts and go swimming. Today I also learned that I may love the act of preparing for the storm more than the actual event itself. Not that I don’t love the howling winds and the sound of rain or the amazing colours the sky becomes, but for some reason the prep work makes me feel like I’m getting ready to go back in time to a land without internet and cell phones. So today, in preparation I cooked up a family sized dish of roast veggies, a bunch of quinoa, several lamb shanks and lamb chops, made some smoothies, bought 50 candles (in two separate varieties, just in case) and prepped 3 different types of tea (spearmint w/ green, my Spring Dragon tea, and plain spearmint) so that I won’t have to go without in case we lost power. I’ve also charged up my kindle and collected all my blankets in case it gets really really cold in here, which would be a nice change from the fires of Mount Doom. Anyhoo, I’m off to class! Stay safe and warm friends. And if Frankenstorm really does arrive with the fury of a thousand hellhounds, then for the love of God, do not go outside! Get a book, make some tea, and curl up with a pet or loved one for the duration. Happy storming! That sounds amazing! Thanks for the well wishes 🙂 stay safe as well!